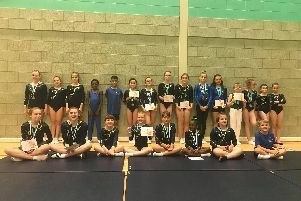 Laura Kelly defended her National Development Group title in style as Orbit Trampoline Club celebrated seven fine performances. Laura was joined n the 13+ group podium by team-mate Lauren Muttitt who claimed the bronze medal, having come eighth last year. In the 9-10 girls, Asami Gynn missed out on a medal, sitting fourth after her first jump before a mistake in her second jump saw her finish seventh. 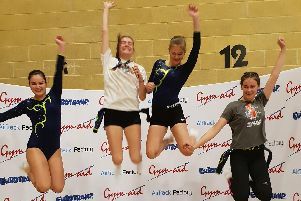 Charlotte Blackmore and Millie Heathcote competed in the 15+ girls level 5 event. Lying third and second after the first routines expectations were high. Disaster almost struck when Charlotte landed perilously close to the springs, but improvisation kept her going to complete a very modified routine. Rather than falling, which had seemed likely Charlotte stayed up in sixth place. Millie performed her second routine with lovely style, appearing magnetised to the centre spot. Her reward was first place and a gold medal. Finally, at the Performance level, Olivia Webb stepped up in the early afternoon. Despite a very steady first routine, the quality of competition left Olivia in eighth place. Her more difficult and complex second routine was performed without error to raise her to seventh place.